A little while ago I reviewed the Arkham Horror: LCG from Fantasy Flight Games and was immensely impressed by the design space of the game and the clever tricks the developers were already playing with. As with my previous Arkham review I will not be spoiling the scenarios, though I may talk about some of the new player cards. Please try and play through the scenarios without spoiling them for yourselves, you will find them much more rewarding that way. As with any LCG you are buying into a bit of a long term commitment and it hasn’t taken long for the first two expansions to hit UK stores: The Dunwich Legacy and Curse of the Rougarou. Let’s talk about the format these expansions will take first of all. 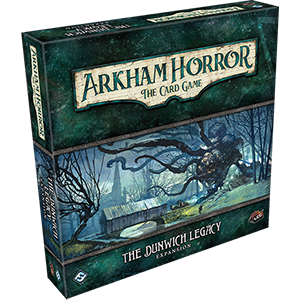 The Dunwich Legacy is the start of a cycle of expansions all with interconnecting stories. This big box expansion has two scenarios in it leading into the stories that the Mythos Packs, which will come about once a month or so, will bring. 6 Mythos packs brings us to the end of the cycle with a massive 8 scenario campaign. That’s a lot of squibbly horrors to face! The ‘Curse of the Rougarou’ is something quite different, and I am really glad to see them doing this kind of content for the game. This is a completely standalone scenario that you can choose to do at any point between chapters of a campaign. Yeah, that’s right it’s a side quest, and what a fun one it is! There is another of these side quests on the way already ‘Carenvale of Horrors’ and I am really looking forward to seeing what they do with this format as the game progresses. Some of the new investigators are really interesting, Zoey being a damage focused guardian who is on a mission from God, Rex a clue hungry seeker with a drinking problem, Ashcan we have already covered, Jenny a rich girl with a missing sister and a soulful Jazz musician by the name of Jim who might just play a song that ends the world . This is the thing about the way Arkham is designed, each of the Investigators, or Gators as they are being called for some unfathomable reason by the wider community, has flaws and those things will affect how your story plays out. I love that. The new player cards introduce a proper taunt, an amazing survivor ally who can reassure you that everything is ok, a risky green card that might save you in a tight spot and a total troll of a card in the form of a mysterious liquid. That last one is worth talking about a little more as once again it shows how much fun the designers are having with this game. It takes up a slot in your deck so it’s a choice to put it in, but who knows when that solution might prove useful. the fact it can be put in any deck means it is not tied to one campaign either so may crop up in any scenario, are you going to take the risk of not having it in, maybe you are? Dunwich is an amazingly strong first expansion and really gives me hope for the game. The designers are obviously having a blast and are being exceptionally good at releasing FAQ and answering questions, a trend I hope they keep up as the game progresses. I’ve played through the Dunwich Scenarios 3 times now and they have turned out a bit different each time. This game just keeps pulling me back in with it’s elegant design, emergent story and interesting, but not overly complex, deck building. Long may it continue!